Baron jug - 2¾" (69 mm) high. If you can't be aisy, be as aisy as you can. The story of Baron Pottery centres around its founder, William Leonard Baron, born in Sidmouth, South Devon, in 1863, his son, William, and his grandson, William. He studied at Lambeth School of Art, and took up his first job at Doulton, Lambeth in the early 1880s. Some time in 1884 he moved down to Barnstaple to work at the Brannam Pottery. Baron was a modeller, designer and potter. He continued his studies at Barnstaple School of Art, and after gaining his master's certificate started to teach pottery himself. He served at Brannam's for nine years, producing many fine designs for the company, making exhibition pieces and winning important commissions. In 1893 he wanted to branch out on his own and, having insufficient capital to start his own works, came to an arrangement with Edwin Beer Fishley whereby Baron's pots were fired at the Fremington Pottery. Within two years he had the necessary wherewithal and started Baron Pottery at Rolle Quay near Barnstaple. An intense rivalry bordering on a feud existed between Baron and his ex-employer, C H Brannam, with Baron using every trick in the book to attract customers to his pottery. He erected signs on the outskirts of the town directing tourists to 'The Pottery', and paid coach drivers to bring parties there. In 1904 he opened a shop for his wares in the town centre. Billy junior worked with his father from leaving school in 1902 and by 1910 was playing an important part in its management. The company continued to flourish through the first part of the twentieth century, but in 1935 Billy was killed trying to save his sister, Jo, from drowning when an unexpected wind blew up during a family outing to the beach. Although an experienced life-saver Billy was unable get Jo to shore and was himself swept away. William senior, by now an elderly man, lost his enthusiasm for the pottery, and when he died two years later, grandson Billy, who was not interested in ceramics allowed the company to be absorbed by Brannam's. 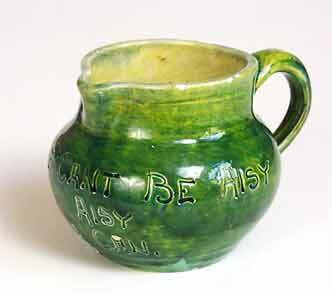 Baron Pottery produced motto wares, puzzle jugs, grotesque and art pottery. It is collected for its quality of design rather than finish. Baron was a natural entertainer and this talent comes across in his designs as well as his choice of mottos and subject matter.